These professional, permanent screen printing inks can be used on a wide variety of porous and non-porous surfaces, including vinyl, metal, clay, leather, and natural and synthetic fabric and paper. Ideal for commercial applications, they have a soft hand and a long open time, giving the user more time to work with individual colors. 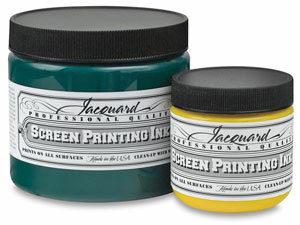 Jacquard Screen Printing Inks are extremely lightfast with great resolution, and their opacity is unparalleled. They won’t wrinkle paper when screening art prints, and they’re washable and dry-cleanable on fabrics after heat-setting or air-curing for at least 72 hours. Cleanup is easy with just soap and water.